Acceptance and commitment therapy (ACT) is among the most remarkable developments in contemporary psychotherapy. This second edition of the pioneering ACT skills-training manual for clinicians provides a comprehensive update—essential for both experienced practitioners and those new to using ACT and its applications. ACT is a proven-effective treatment for numerous mental health issues, including depression, anxiety, stress, addictions, eating disorders, schizophrenia, borderline personality disorder, and more. 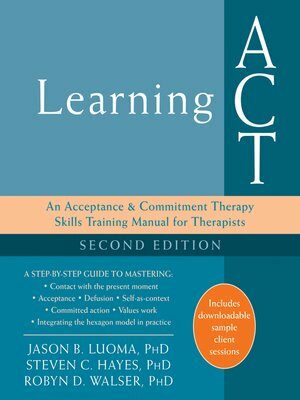 With important revisions based on new developments in contextual behavioral science, Learning ACT, Second Edition includes up-to-date exercises and references, as well as material on traditional, evidence-based behavioral techniques for use within the ACT framework. In this fully revised and updated edition of Learning ACT, you'll find workbook-format exercises to help you understand and take advantage of ACT's unique six process model—both as a tool for diagnosis and case conceptualization, and as a basis for structuring treatments for clients. You'll also find up-to-the-minute information on process coaching, new experiential exercises, an increased focus on functional analysis, and downloadable extras that include role-played examples of the core ACT processes in action. By practicing the exercises in this workbook, you'll learn how this powerful modality can improve clients' psychological flexibility and help them to live better lives. Whether you're a clinician looking for in-depth training and better treatment outcomes for individual clients, a student seeking a better understanding of this powerful modality, or anyone interested in contextual behavioral science, this second edition provides a comprehensive revision to an important ACT resource.